1. Combine Italian herb blend, coriander, fennel, 1/2 teaspoon black pepper, and 1/4 teaspoon salt in a bowl. Sprinkle on the salmon fillets. 2. Rub asparagus with 2 Tablespoons olive oil, 1/4 teaspoon of salt, 1/4 teaspoon of black pepper and garlic. 3. Combine 2 Tablespoons olive oil, kalamata olives, capers, parsley, and lemon juice. Reserve. 4. 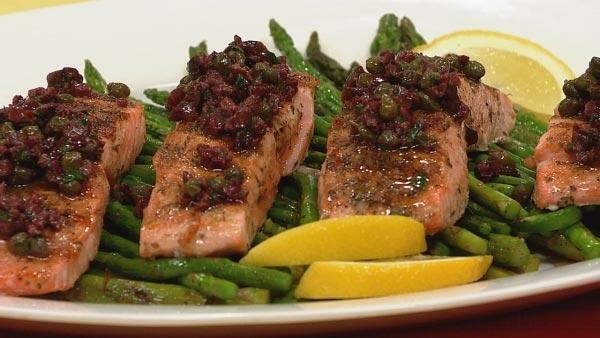 Rub salmon with 1 Tablespoon of olive oil. Gill over medium high heat until the salmon is moist but cooked (about 3-4 minutes per side depending on the thickness of the salmon). At the same time, grill the asparagus until it is al dente. 5. Place asparagus on the bottom of a platter. Top with salmon and then the olive/caper mixture.